Intermateable with MIL-DTL-5015 connectors, Amphenol Industrial’s 97 Series is ideal for a broad range of non-environmental general duty applications. Heilind is now stocking Amphenol Industrial’s 97 Series 5015 style connectors – a versatile, cost-effective solution for non-environmental general duty applications. Heilind Electronics, a leading global distributor of electronic components and authorized distributor for Amphenol Industrial, has expanded its selection of industrial interconnects with the manufacturer’s 97 Series 5015 style connectors. Amphenol's 97 Series general duty standard cylindrical connectors serve as a lower cost, commercial equivalent to MIL-DTL-5015 connectors. 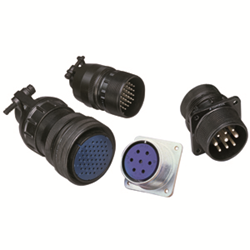 This extremely versatile and rugged connector family is used in the automotive, robotics, machine tool and welding industries, as well as in numerous commercial applications ranging from heavy equipment to ECG monitoring cables. UL and CSA recognized, the 97 Series is highly versatile. Customers can choose from six shell options, 128 contact arrangements and one of the largest selections of insert patterns in the market. The connectors are available in a wide variety of cadmium and non-cadmium finishes, while contacts are offered in crimp, solder, thermocouple and PCB styles. Visit Heilind's website for more information about Amphenol Industrial 97 Series 5015 style connectors.